Up to 15-year prison sentence is sought for 24 journalists who were detained during a raid on Kurdish daily Azadiya Welat last year. The Swedish Police has raided the studios of Aryen TV, broadcasting content geared towards Eastern Kurdistan. Searches in the network’s offices continue. The Swiss Freethinker Association ‘Frei Denken’ bestowed this year’s "Freethinker Prize" to jailed Kurdish journalist Zehra Doğan and Iranian journalist Masih Alinejad. Twitter has blocked access to the official account of ANF Turkish service in Turkey. Journalists İnan Kızılkaya and Kemal Sancılı, who were on remand in the Özgür Gündem case, have been released from prison. Journalists staged a march hand in hand and shoulder to shoulder demanding the release of their jailed colleagues, with the support of HDP and CHP members of the parliament in the very forefront. Journalist Zeynep Kuray has been detained as result of a house raid in Istanbul Wednesday night. Several journalists have been detained in early morning house raids in Ankara. Turkey has taken legal action against yet another foreign journalist reporting on the conflict between the Turkish state and the Kurdish people. 25th Musa Anter and Free Press Martyrs Journalism Awards Ceremony due to be held in Istanbul today, has been banned by Beyoğlu District Governorate. Rojnews cameraman Mihemed Welî has been taken into custody by the asayish in Sulaymaniyah while covering a demonstration before the arrival of KDP leader Masoud Barzani. Journalist Oktay Candemir who stands trial for his news articles has received 18 months prison sentence. 30 journalists were detained and 14 of them are arrested and set to prison between 1-31 August in Turkey, Free Journalists’ Initiative (OGI) said in a report. Writer Aslı Erdoğan who was to travel to Germany to accept a peace prize had her passport seized by Turkish authorities. The Kurdistan Democratic Party (KDP) has halted local broadcast from the channel NRT through the Directorate of Media, Printing and Publications in Hewler. The French state that has long remained silent on Turkey’s fascistic practices has finally reacted to Turkey for jailing a French journalist. 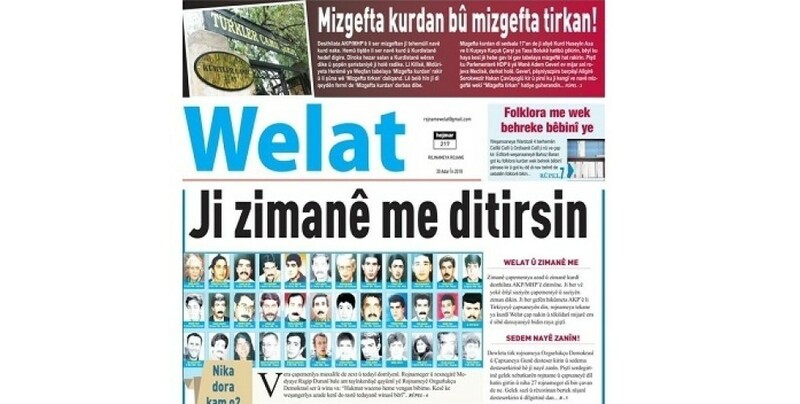 The Kurdish newspaper 'Welat' (Homeland) has started publication. The first issue of the newspaper has been published today with the headline ‘Free press will not be crashed, will not fall'. 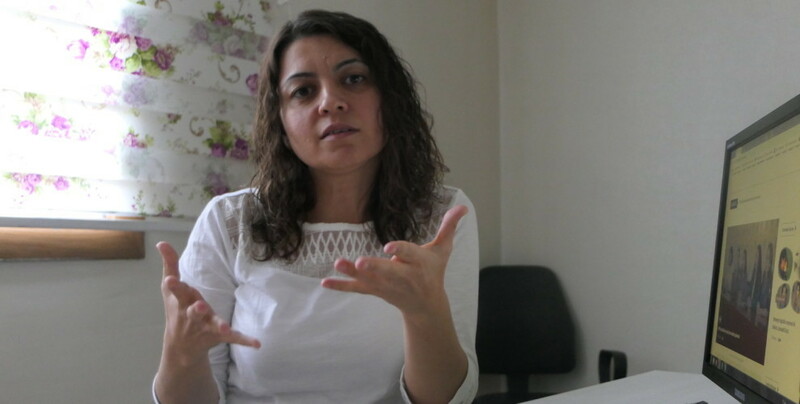 Özgürlükçü Demokrasi employee Semiha Mete who was detained during newspaper distribution in İzmir’s Buca district on August 21, has been jailed. The central office of Dihaber news agency, which was shut down with statutory decree No 693 issued at midnight, has been sealed. The women’s journalism website Şûjin, with their motto “A packing needle [“şûjin”] against the masculine language of the mainstream media”, has been shut down by the government of Turkey with a statutory decree targeting the free press. The AKP government has issued two new Statutory Decrees and shut down the Rojeva Medya newspaper, the Gazete Şûjin website and the Diyarbakır-Dicle Medya news agency. The women’s journalism website Şûjin, with their motto “A packing needle [“şûjin”] against the masculine language of the mainstream media”, is recovering from a cyber attack. English PEN has joined colleagues around the world in calling for immediate release of Kurdish journalist and artist Zehra Doğan. Turkey is ranked 155th out of 180 countries in RSF’s 2017 World Press Freedom Index. The already worrying media situation has become critical under the state of emergency. Around 150 media outlets have been closed and more than 100 journalists are jailed.